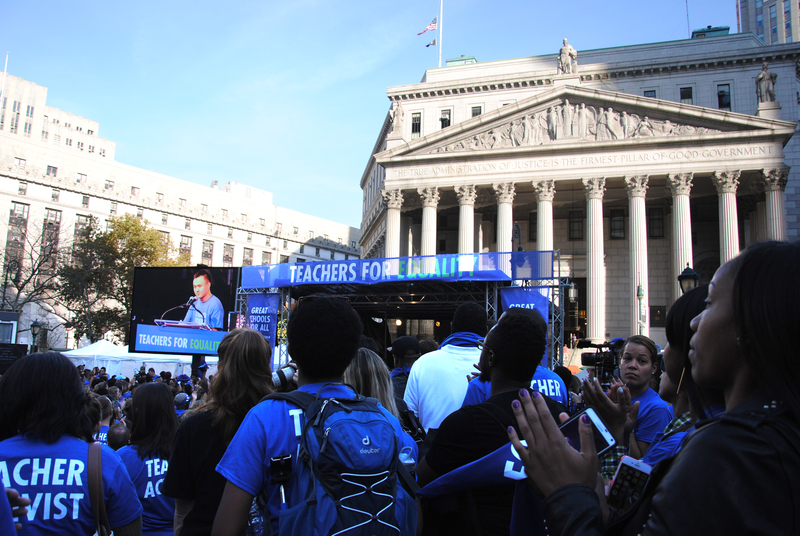 In a sea of royal blue t-shirts, throngs of charter school teachers, administrative workers and parents packed into Foley Square, grabbing free tote bags and doughnuts in the fading sunlight. Waving flags reading “Don’t Steal Possible” while bobbing to a DJ set by Mayer Hawthorne, young teachers from Staten Island to the Bronx intermingled, taking pictures with free selfie sticks. 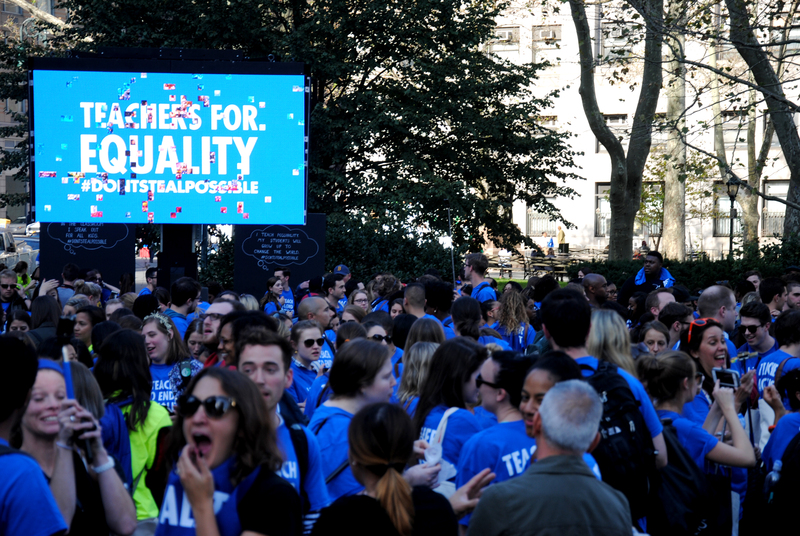 Yet through the party-like atmosphere, the event organized by Families for Excellent Schools Wednesday featured teachers rallying against a school system deemed unequal in their eyes. 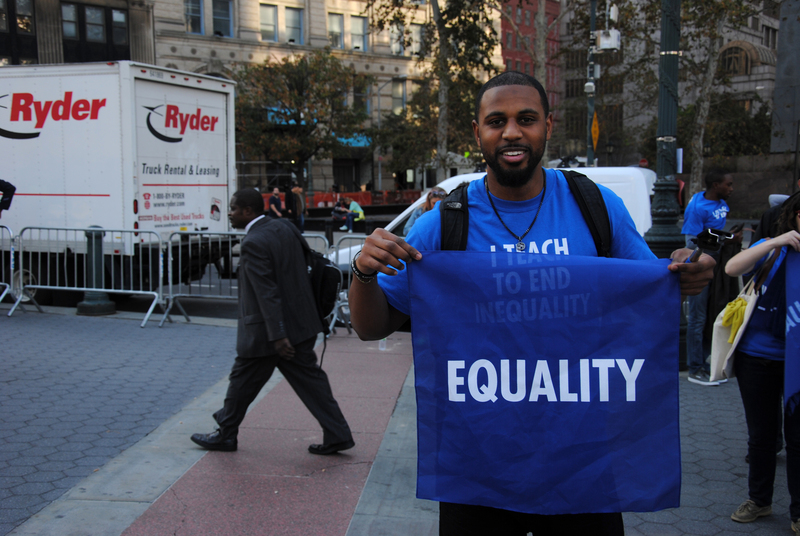 Families for Excellent Schools, founded in 2011, is an advocacy group calling for all New York City school children to have an equal opportunity to a quality education, and improving schools in minority and lower-economic areas of the city by pushing policy makers to action and expanding charter schools. An estimate of 487,000 students are confined to low-preforming schools by districting, according the group’s recent study. 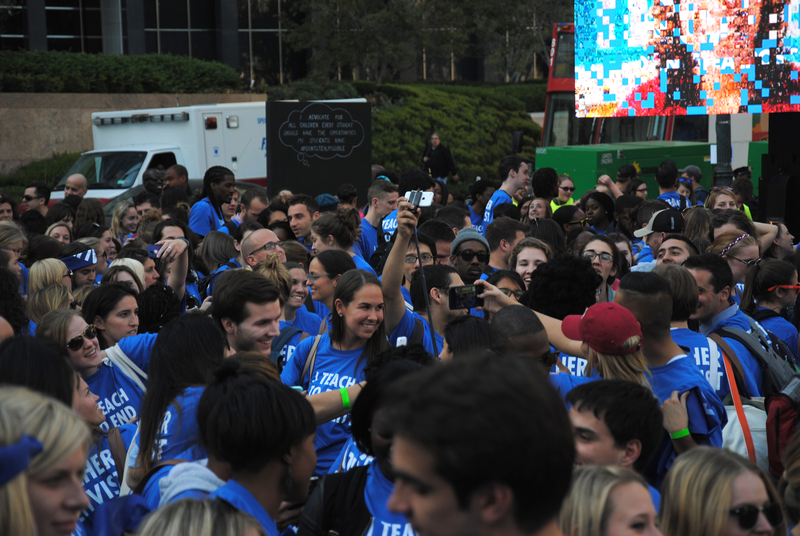 Within that estimate, 90 percent are students of color and 89 percent are living in poverty. 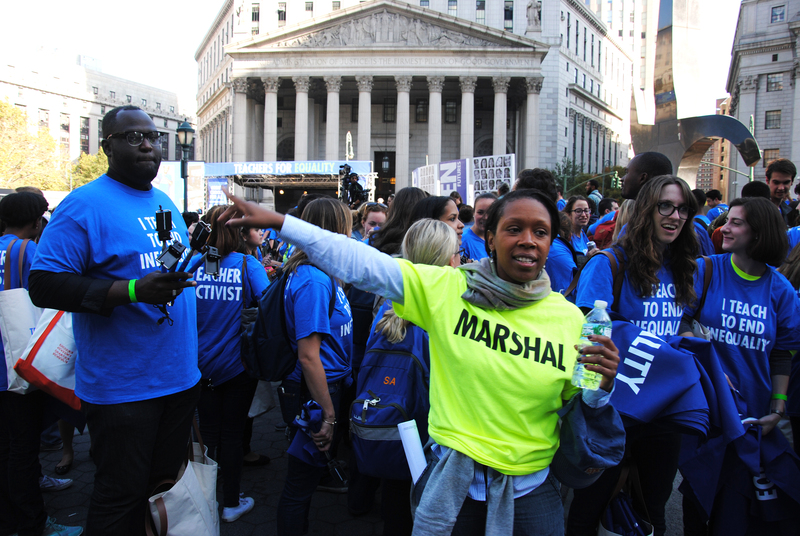 And while graduation rates of students has increased across the board over the last seven years, rates for black and Hispanic students still lag 20 percent lower than white and Asian students, according to the NYC Department of Education. 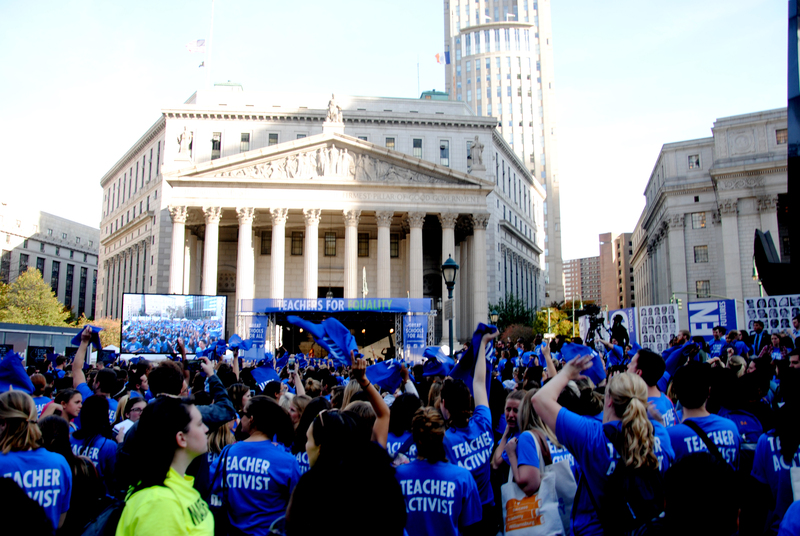 Though this education gap is visible throughout the five boroughs, the use of charter schools to fill the gap has not been substantiated. The majority of studies, including those from the U.S. Department of Education and the University of California at San Diego, have found that charter schools in general are only on par with traditional public schools. 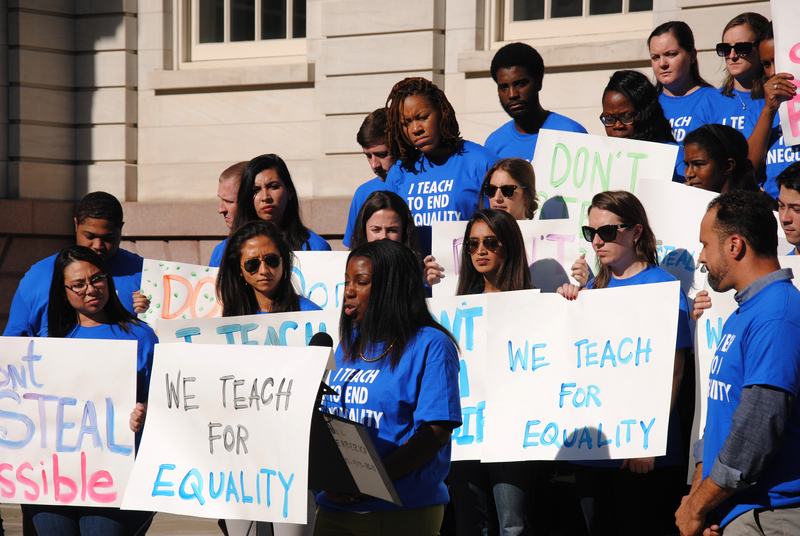 Though the reviews and opinions of charter school education may be mixed, the teachers and parents of Families for Excellent Schools want their children to not suffer in the same ways that many of the members had suffered in failing schools. They have had to deal with the lack of resources and low-quality education themselves and are moved to stop the cycle of failing schools.